- FMRTE keep "Loading game data"
I am having issues with FMRTE as it just keeps "Loading game data..." when I try to load a saved game on my Surface Pro 6. I have no issues using FMRTE on my Desktop which has a slower processor. Tried running as admin and also tried changing the compatibility but still having the same issue. Both my Surface Pro 6 and my desktop are running Windows 10 and have the same antivirus. Just can't figure out why I can't get FMRTE to work on the Surface Pro... The Surface Pro runs FM19 perfectly, even better than my Desktop but I can't fathom why it doesn't seem to run FMRTE. On a side not, I have tried running Genie Scout and that works fine on the Surface Pro. 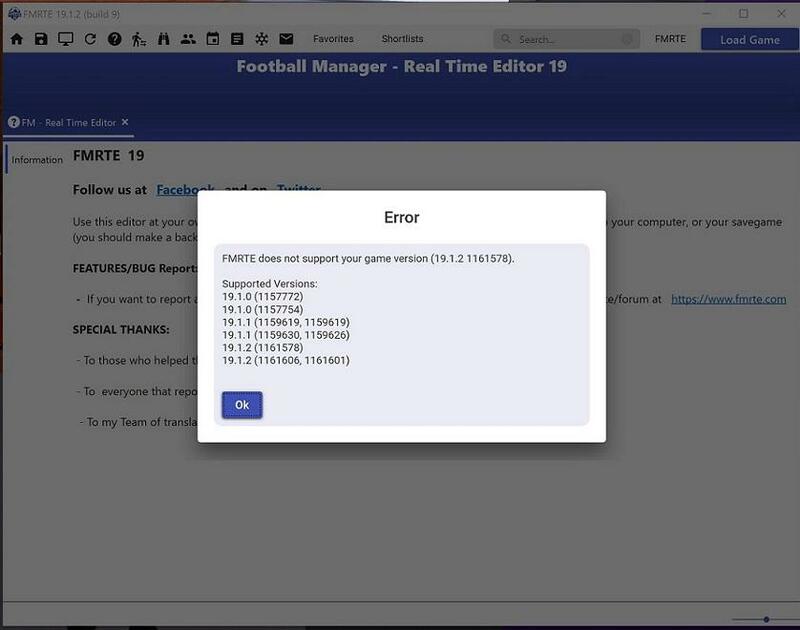 I just tried to run FMRTE again today with the debug mode and got this error. Now I can't even load the game data so can't provide a bug report. It says it does not support my game version (19.1.2.1161578), however it is listed as one of the supported versions. I have not downloaded or reinstalled since yesterday. Fixed the previous problem by uninstalling and re-installing FMRTE. Ran in debug mode and tried loading the game. After 5 or so mins of "Loading game data..." it finally loads my game but FMRTE seems very slow to respond to tasks. Unable to provide bug report because it loads up eventually. But the sluggishness of the program is strange. I don't have this issue on my less powerful device (my Desktop) compared to my more powerful Surface Pro. Any ideas why BraCa?? I'm glad it kinda of works.. But can you still provide us the error.log?